A very common reaction to the thought of “microbes” is a compelling desire to slather up in hand sanitizer! However, it is seldom realized that the greatest majority of microorganisms are at the very least not harmful, and at the most necessary for human life! Many aspects of microbial interaction with our environment allow it to be so perfect for humans. Some of these aspects include oxygen generation, nitrogen fixation, decomposition, food-chain contributions, food production, and antibiotic production. However, in this blog I want to highlight one specific aspect of the contribution that microbes make to our lives and our environment by focusing on symbiotic relationships. A symbiotic relationship is one in which at least one partner must be in the relationship in order to survive. We know now that symbiotic relationships between microbes and other organisms are common, and are proving to be more of the rule of life than the exception. 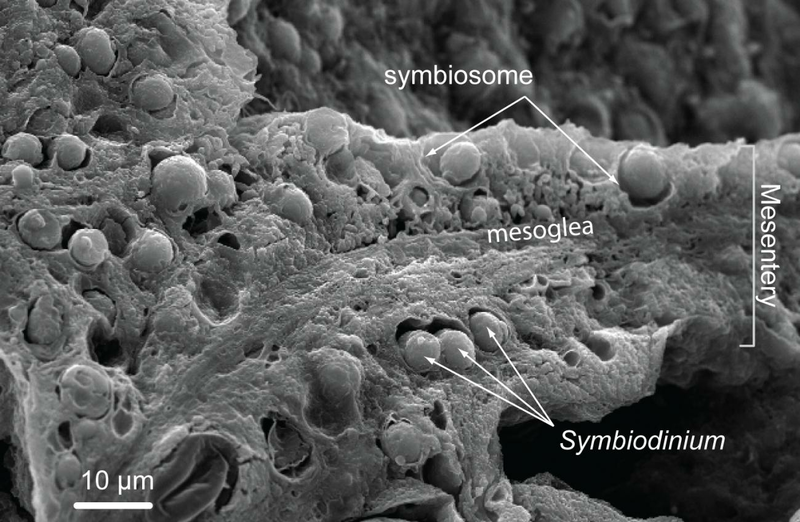 A popular example of symbiosis is the relationship that corals have with algal cells living within them (Fig. 1).The algal cell within the coral photosynthesizes providing metabolic products for the coral to consume, and the coral offers a safe living environment for the alga. When corals become stressed, they often expel the algal cells, causing “bleaching,” and usually soon after die. Corals are the builders of the oceans; constructing reefs that provide safety and an environment for thousands of other organisms to live and thrive. Lichens are another example of symbiosis involving microorganisms. Lichens typically grow on rocks or the bark of trees and are a symbiosis of algal or cyanobacterial cells living within a fungal matrix of hyphae (long, hair-like fungal cells). Together these organisms form what we know as lichens that are not only beautiful, but form an important part of the food chain for other organisms. Even more widespread and important, is the symbiosis of bacteria in the guts of all plant-consuming animals. Animals and humans lack the ability to metabolize plants because they can’t digest cellulose, a polymer of glucose that makes up the woody (fibrous) parts of all plants. This glucose is linked together in a fashion that prevents our enzymes from breaking it apart. Nevertheless, cellulose is the main source of carbon and energy for many animals that live on grass, straw, and, in the winters, eat bark right off the trunks of trees. These animals are able to survive on cellulose because they have bacterial symbionts in their guts that convert it into various fats, which can then be digested and consumed for nutrition. I imagine when God spoke the plants and animals into existence and gave them the “herbs of the field to eat,”(Gen 1:30) that He also, in the same breath, created a system of symbiosis where every animal was constantly dependent on something unseen to provide nutrients – an important spiritual lesson of our dependence on God for our daily bread, not only to nourish our physical bodies, but to sustain our spiritual being. New studies of symbiosis in humans reveal that the bacteria in our guts profoundly impact our health: our microbiome affects obesity, diabetes, autoimmune diseases, and mental disorders. Scientists are discovering that the foods we eat not only affect our own health, but the health and variety of our microbiome, which then, in turn, affects our health. Some microbes in our intestines produce vitamin K, a vital nutrient. Researchers now know that human exposure to microbes causes an improvement of their immunity and decreases allergies like hay-fever. Symptoms of some deadly allergies like lupus and rheumatoid arthritis can even be reduced by introduction of microbe infections such as worms. The number of microorganisms in our body is equal to the number of our own cells, however due to their microscopic size we outweigh them! I believe that when God formed humans he built into us a symbiotic relationship with microorganisms that is part of who we are and aids in the functioning of our bodies. Once again, a spiritual lesson for God’s quiet, but constant help as we make our way through this world. A final example of a symbiotic relationship is that between soil microbes and plants. Of the vascular plants researched, 95% were found to be associated with mycorrhizae, which are fungi that associate with roots of plants. 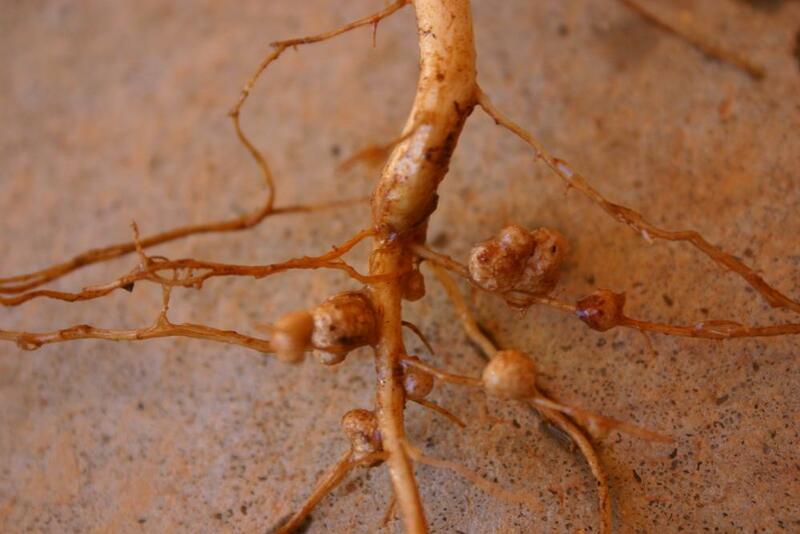 Additionally, some types of bacteria, referred to as rhizobia, live within the roots of legume plants (such as soybeans, alfalfa, and peanuts) in specialized structures called root nodules where the bacteria provide nitrogen to the plant, and the plant supplies the bacteria with simple sugars (Fig. 2). Our world is interdependent. God created us to be in association with each other. This is not only seen among humans, but in other created organisms as well. We admit that sin has had an effect on all of creation, and the Darwinian competition and struggle for survival might be an expression of this. However, cooperation and positive interaction between organisms, even of different species, is also an important narrative in biology. One lesson we can glean from this look into the natural world of microorganisms and symbiosis is that we are happiest and healthiest when we are living our lives in service to one another.